The Panasonic Lumix G 7-14mm:F4 ASPH lens is the Japanese retail version. The included paper manual is in Japanese. This lens for the Micro Four Thirds mount. Despite the impressive 7-14mm wide-angle range, this lens is rather compact and lightweight- perfect for casual use. For more detailed specifications, see the Official Panasonic website. If you own a Panasonic or Olympus Micro Four Thirds camera, you need this lens in your kit. We're confident in our low prices! If you can find this item for less at another shop, email us with the link and we can probably beat their price! 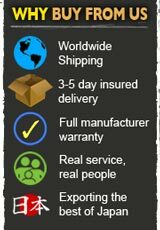 Free shipping by insured EMS express worldwide! Delivery usually takes 3 to 5 days.